1.Preheat oven to 350 degrees F (175 degrees C). Grease a 9×13 inch pan. 2. In a large bowl, mix together the oats, sweetened condensed milk, butter, coconut, almonds, chocolate chips and cranberries with your hands until well blended. Press flat into the prepared pan. 3. Bake for 20 to 25 minutes in the preheated oven, depending on how crunchy you want them. Lightly browned just around the edges will give you moist, chewy bars. Let cool for 5 minutes, cut into squares then let cool completely before serving. 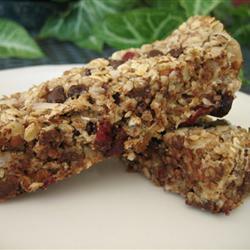 Those granola bars look sooo delish!! I'll have to try the recipe and hope the kids will like them so that I don't have to eat them all!!! I don't have an RV, but I love all the pictures!! Thank you for your comment cottage lover!